Gioteck was unknown to me until this week when it pulled the wraps off the new EX-01 headset that is headed to the US. The company has now announced a new MX-1 Media Remote that will be coming to the States as well. The new remote is designed to control the PS3 with full control for Blu-ray, DVD and the Cross Media Bar. The catch is that the remote is apparently an IR unit, which the PS3 can’t just pick up. We have seen several new headsets for gamers get unveiled at E3 so far this year. One of the new headsets is the Gioteck EX-01 Bluetooth headset for the PS3. The wireless headset looks like a headset for a smartphone. 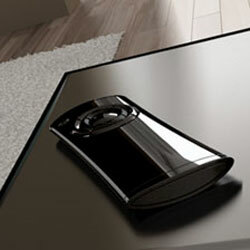 The device is designed for gamers and wirelessly connects to the PS3. It has a cushioned on-ear external speaker and ergonomic controls. The controls include volume and power buttons on the outside of the earpiece. If you or someone you know is a fan of Twilight, you can now get wall and gadget adhesive graphics for your stuff. 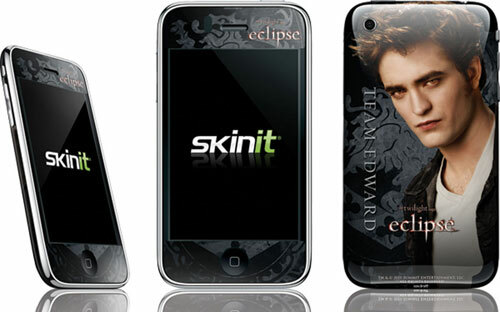 Skinit is offering the new skins with images and themes from the Twilight: Eclipse film. The skins are being offered for the iPhone, notebooks, the Kindle, wall sized, and other devices. The skins are available right now before the film hits theaters. When I travel with my family on road trips, we tend to take a lot of electronics. My wife can’t stay off Facebook very long and when she gets to texting, the battery doesn’t last long. The Power Station Traveler is a cool gadget charger for the car perfect for those road trips. The thing is a carry bag with spots and grips for three devices. You plug the device chargers into the case and then connect one DC cord to the car power adapter. The case has a strap that keeps it in place when you drive. I don’t like taking my gadgets near water or to places where dust is an issue. I don’t want to kill my gear with an accidental splash or getting dust into the works. Grace Digital Audio has a new speaker for the iPhone, iPod and any other device with a 3.5mm headphone port that will protect your device while you listen. 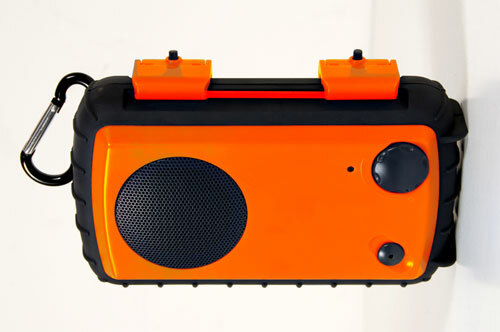 The new speaker is called the Eco Extreme and it has a 3-inch full range driver in the front and attaches to a bag with a 2-inch carabiner. The speaker is rubberized to protect it from drops and is water resistant to IPX7 standards. If I have to work from my laptop or my netbook for any length of time, I almost always take a laptop stand with me. I hate looking down at the screen; it gives me a headache after a while. The catch is that most notebook stands are so bulky you can’t fit them into a notebook bag. AViiQ has announced a new notebook stand simply called the Portable Laptop Stand, and the name describes the stand well. The little stand is only a quarter of an inch thick when folded up. I used the WildCharge system for my iPhone 3GS for a long time. I liked that I didn’t have to plug the iPhone in each time, but having to remove the case for synchronizing the phone got on my nerves. 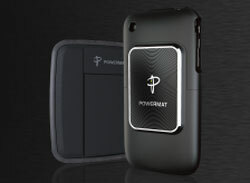 A new wireless charging system from Powermat has debuts that is specifically designed for the iPhone 3G/3GS. 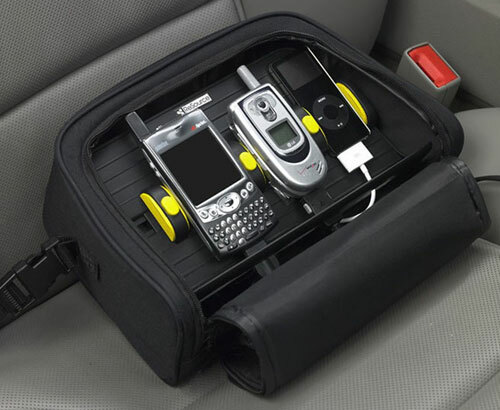 The handset includes a receiver case for the iPhone 3G/3GS, the power mat, and an AC adapter. Lots of users take their iPod to the gym and keep them on their arm in one of those strap cases. The problem is that when you exercise sweat and odor can get into the band and make your gear extra smelly. iSkin has announced a new case for the 5th generation iPod nano that has Microban antimicrobial protection built-in. The Microban protection promises to reduce odors and stains on the armband. I’m probably in the minority here, but I’ve never understood the whole men/women/diamonds scam. Diamonds are so over inflated in price, monopolized and all played out. But what are you gonna do? It’s what the ladies want as a symbol of love. 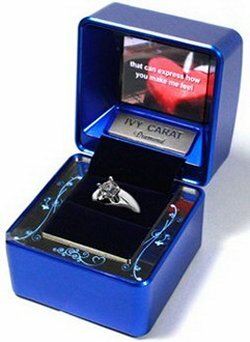 Might as well spice things up with this Ivy Carat Jewelry Case. When you pop the question, the ring is still in the front, but there’s also a 2.0 inch LCD screen with a speaker, which will play music. You load and charge it via a laptop and USB port. Just pick your content and you are good to go. Any parent will tell you that with kids around you are going to end up cleaning goo off the strangest places. I have had to clean peanut butter off the back of the refrigerator (don’t ask) and have spent more time than I care to talk about with a tooth pick and a paper towel trying to get chocolate out of the crevices of my Harmony One remote control. A company called Gluvi has a new sanitary solution for remote controls that looks to me like a condom for your remote. The thing has an open end and slips over the remote to protect the keys from germs. I bet it works pretty well for keeping chocolate fingers away too. I have never broken a bone, but in high school, one of the cheerleaders fell off a pyramid during a routine and broke her arm. The next day she had a new cast with a maroon cover over it to keep things neat. If you have a cast and want something cool to cover the white cast. A company called Casttoo has some really cool covers for your cast that feature what look like cartoon images of broken bones with covers for different sizes and types of casts for your arm or leg. I am betting that there are lots of people who work in offices in and out of the tech world that can relate to Dilbert and his office woes. I have had a few bosses that were as trying as Pointy-haired Boss and coworkers I wanted to kick in the groin. 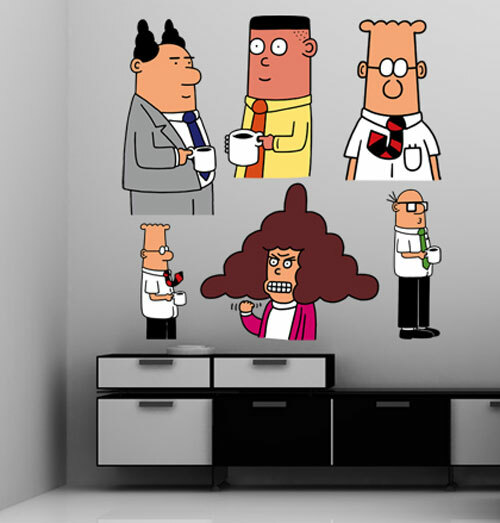 If you are a big fan of Dilbert, a company called LTL Prints has announced that it is offering wall graphics from the strip. Just about every character from the comic is available from Dilbert and Dogbert to the Pointy-haired one. Getting a new high-end flat screen LCD, plasma or LED TV this holiday season and have kids, pets or maybe a moderately clumsy person in the house? You may want to consider protecting the display on that investment with one of these acrylic protective shields from TV Armor. We wrote about protective products from TV Armor back in September and since then the company has really been gaining traction and popularity. Let’s face it, even though flat-screen TV’s are getting a little less expensive they still are certainly not cheap. The last thing you want is a pet or kids toy, or worse yet this guy over to your house and smash something into that new big screen. I always forget to bring my Bluetooth headset inside from my car and charge it. That means each time I want to use it the thing is usually dead. 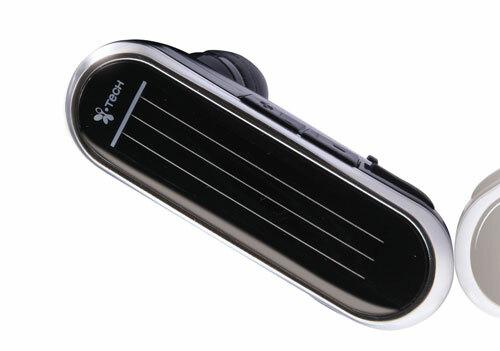 i.Tech has announced a new Bluetooth headset that will help me stay powered up for hands free use called the SolarVoice 908. The device has solar panels on the back to help charge the battery and features sound reduction technology to eliminate background noise. The headset also uses a design that allows air to flow to the ear canal so your ears don’t feel plugged up when you wear the headset. Alarm clocks that will dock and charge your iPod or iPhone are great. That way you can wake to your favorite music rather than whatever happens to be on the radio. With the popularity of the iPhone and iPods, many homes have two or more devices in the house. The average docking alarm clock can only charge one device. 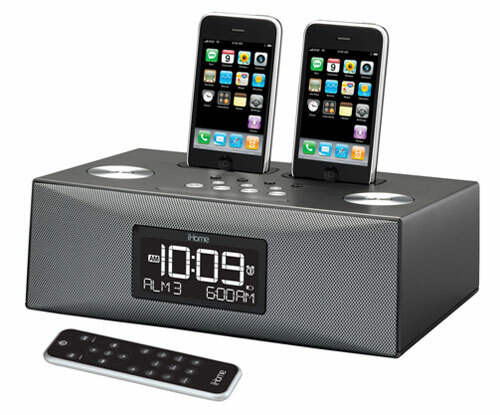 iHome has unveiled its new iP88 dual Dock Radio & Alarm System for iPhone. The device has a pair of docks on the top that can charge the iPhone and any dockable iPod. It can wake you to iPod music, AM/FM radio or a buzzer. The user can set three alarms.